As the race for a play-off place continues to hot up in the Evo-Stik Premier, fifth-placed Farsley Celtic end a tough week of fixtures with yet another big game against their play-off rivals. Despite their high position in the league, tomorrow’s visitors to Throstle Nest, Warrington, have been struggling for form and look to be heading for the play-offs after challenging for the title for most of the season. However, the form or position of any of Farsley’s opponents will not matter too much to them at this stage, with Adam Lakeland’s men purely focused on keeping their place in the play-offs as the margin for error continues to reach its lowest point. 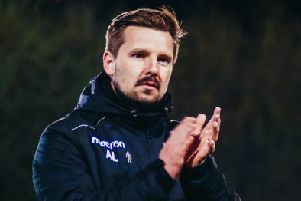 For Michael Morton’s Tadcaster Albion, meanwhile, it seems to be all or nothing in Evo-Stik North, with tomorrow’s fixture giving them a chance to once again re-ignite their faltering play-off race when they welcome struggling Radcliffe Borough. Also undergoing a recent results hangover are Ossett Albion, with their previous record of five wins on the trot now seeing them come into tomorrow’s match at Glossop North End having taken only two points from their last three games. Tomorrow could prove to be a tough outing for Albion, with Glossop showing some impressive recent form as they look to keep their slim play-off hopes alive. Elsewhere, Ossett Town welcome mid-table Atherton Collieries looking for only their second victory in eight games, while Brighouse Town look to finally seal their league status in a very tough trip to promotion contenders, Scarborough Athletic. As they continue their chase for an unlikely Evo-Stik South automatic promotion spot, free-scoring Frickley Athletic face the side they will hope to be joining in the Evo-Stik Premier at the end of the season. Already-promoted league leaders, Basford United, are the next visitors to Westfield Lane. Meanwhile, Harrogate Town will be looking to keep up the pressure on National League North leaders Salford City when they host Southport, while Bradford Park Avenue travel to Boston United to try and kick on from their victory against Leamington. Title favourites Pontefract Collieries face eight games in 16 days, starting with a trip to Penistone Church in the Premier Division, writes CONNOR CRAIG-JACKSON. Collieries have been threatening to reclaim top spot for the best part of four months now, and this upcoming congested period is an opportunity to complete their quest for the summit. Pontefract, however, could be in for a very tough outing with Penistone, who beat them 2-1 as recently as March and have not lost in their last eight games. Pontefract’s promotion rivals, Pickering Town, meanwhile, will be chasing a much-needed win at Barton Town, after suffering a recent blip. Hemsworth Miners Welfare look for a fifth win in a row when they host Thackley, while mid-table Liversedge host Maltby Main. Harrogate Railway Athletic host close rivals Albion Sports, still desperate to ease their relegation worries, while Garforth Town have an all-Yorkshire affair in their trip to Bridlington Town. Despite already being promoted from Division One, league leaders Knaresborough Town can still make sure that they have a say in the wider race for promotion in tomorrow’s match at play-off-chasing Glasshoughton Welfare. The home side still occupy the final play-off position, but remain under heavy threat from a congested play-off pack and will hope that they can keep up their impressive recent form when the champions-elect come to visit. Waiting in the wings, however, will be play-off hopefuls Selby Town, looking to capitalise on any slip-up from Glasshoughton when they host Swallownest. And Yorkshire Amateur remain hopeful of grabbing an automatic promotion spot as they host FC Bolsover, while AFC Emley entertain Rossington Main and Nostell Miners host Brigg Town.